Marble, granite, sandstone and limestone are tough challenges for the average drill rig, but a new solution that has just been introduced makes the job faster and less costly. It comes in the form of SpeedROC 2F, a robust and versatile drill rig from Atlas Copco, specially designed for the dimension stone industry. The big advantage of this rig is its high productivity provided by a 360-degree coverage area, long boom reach, flexible drilling capacity, fast positioning and high tramming stability. The all-round coverage saves time when positioning the rig while the long, rotatable boom is perfectly suited to both bench drilling and block dressing. Equipped with two well proven hydraulic rock drills, the SpeedROC 2F can be used for both vertical as well as horizontal drilling and has four support legs giving total stability even when using the rig at its maximum capacity. The rig is also Radio Remote Controlled, assuring not only fast and accurate drilling but also a high level of safety for the operator, while a dust collection system add to the working environment. There is also a water mist option available. 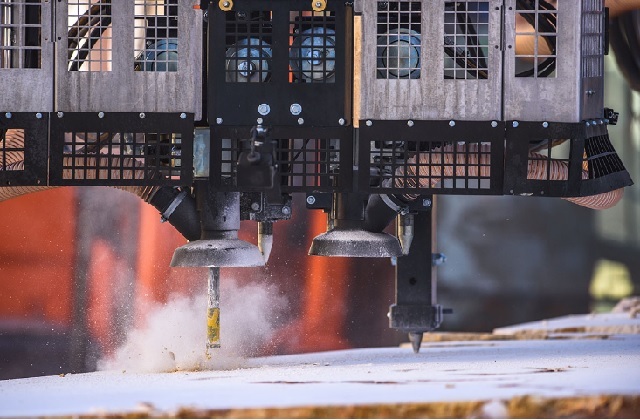 SpeedROC 2F has come at a very important time for the dimension stone industry and we believe it will play a key role in the ongoing effort to boost productivity and reduce costs. Not only that, our genuine parts and service solutions enable SpeedROC 2F owners to strike the optimum balance between productivity, availability and operational cost. 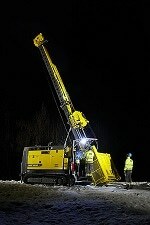 SpeedROC 2F has a choice of tophammer rock drills, the DF 500X or DF 530X and a hole range of 28–45 mm.